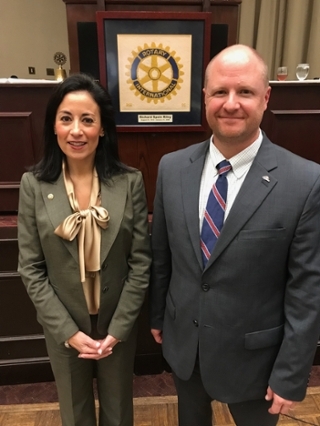 Samford University’s Brock School of Business professor, Rusty Yerkes, served as the keynote speaker at the Rotary Club of Birmingham’s meeting on Feb. 28. Yerkes’ talk entitled “Blockchain, Cryptocurrencies and Initial Coin Offerings” explained blockchain and distributed ledger technology and how cyrptocurrencies, such as bitcoin, operate on the blockchain platform. Yerkes also touched on the rapid explosion of the cryptocurrency market and the widespread use of initial coin offerings (ICOs) as a means of raising capital. “The Rotary Club of Birmingham is one of the oldest and largest rotary clubs with more than 650 members. The membership includes many Birmingham business and community leaders and my hope for the talk was for those in attendance to learn about the value of blockchain technology and take those ideas back to their organization or an organization they are involved with,” Yerkes said. Yerkes was joined by Rotary Club of Birmingham President and Samford's Vice President of Marketing and Communication, Betsy Holloway. Learn more about Professor Yerkes and his areas of study here.